You might remember Randall Gay from being the rookie cornerback who led the Patriots to win Super Bowl XXXIX. Now Randall Gay has signed a large 4 year contract with the Saints and has made the most of it. 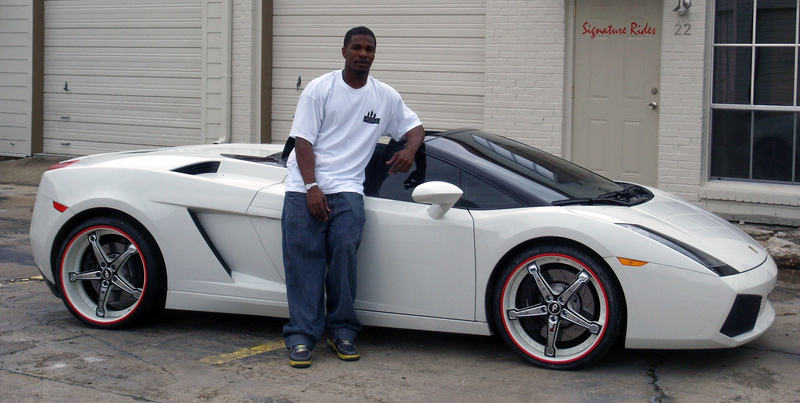 He got his two cars customized at Signature Rides in Baton Rouge, Louisiana. The Lambo looks amazing with 20″ Forgiato Martellato wheels painted white and chrome with a red pinstripe. The tints on the windows is also a nice touch, you dont see that on too many spyders. The Bentley looks just as good. The 22″ Forgiato Estremos perfectly match this Bentley Continental GT with its chrome and black finish.